The level of service was truly faultless"
"What can we say a perfect holiday, the crew are just the best!" "Activities - Fantastic. Found a new love for biking (again), that I might not have done w/o this cruise. It was lovely to see the Highland scenery in such an active, participating manner." wondrous scenery and excellent food and service on the boat - a smashing experience! Welcome aboard a Caledonian Discovery holiday and unwind into ‘Highland time’. 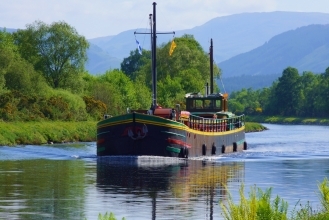 Join us on a wonderful cruise along the Great Glen, taking in the spectacular scenery of the Caledonian Canal and the beautiful inland lochs of Loch Ness, Loch Oich and Loch Lochy. Come with us on our gentle, active holiday, joining in with our outdoor activities or simply relaxing on board. Our unique holiday barges, ‘Fingal of Caledonia’ and ‘Ros Crana’, will be your Scottish Highland home for the week, whilst our friendly skipper and attentive crew look after you. Meals are freshly prepared by the resident, live aboard cook using local Scottish produce. This is a soft adventure for people of all ages, so come and relax into the gentle world of life afloat. The price includes accommodation in an en-suite twin berth cabin, all meals and instruction and equipment for our activities. You can Book online, contact us by e-mail, or phone our friendly office staff who will be happy to speak to you and answer all your questions.